← Lives can’t help but change. You’ve been here how many times??? 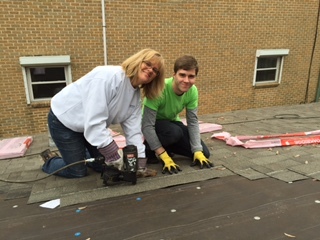 Volunteers and staff working on Ms. Shirley’s roof. We rang in the New Year this last week with teams from 4 churches from across the USA; California, Illinois, Michigan and Maryland. 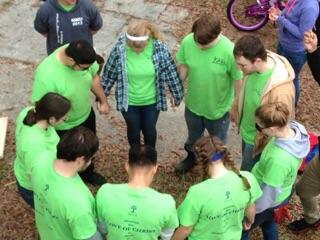 A total of 52 volunteers, one of which was our son, Brad, were on 4 different job sites in New Orleans. 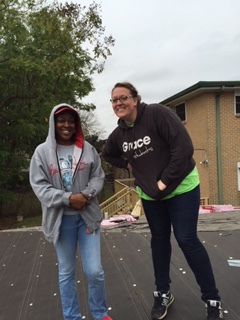 What a blessing it was to see a couple of homes near completion and 2 properties with the very first volunteers ever! One of those properties was Ms. Shirley’s house. Remember now that Hurricane Katrina hit 9 1/2 years ago. Ms. Shirley has been living in alternate housing awaiting the resources to begin work on her home for that long! 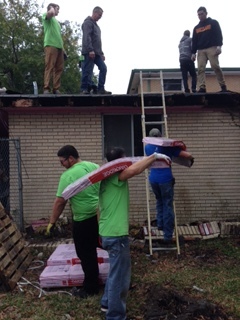 The first thing that needed to be done, before the inside could be started, was a new roof. 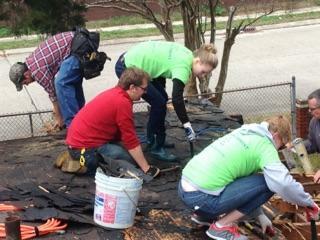 And this week 20 people from Maryland and Michigan worked on that roof. You see, since 4 months after the storm in December, 2005, Terah has been to New Orleans to help with Hurricane Katrina Recovery almost every Christmas break and a few times in between. When asked why she keeps coming back she said, “Because of ReachGlobal’s heart and vision, the staff and the special people of New Orleans. They’re like no other in the world.” She has met many “Ms. Shirley’s” in those years. To Terah, it’s truly not about the work, it’s about the people and the relationships she forms not only with the homeowners but with her team members, members of other teams that are serving with her, the staff and even local restaurant owners. When asked what the most impactful thing God has taught her is she replied that He has taught her that “He is in ultimate control. No matter how much, how long, or how thoroughly she plans these trips, He can and will change the plans to reflect His will and she is only along for the ride and she is to obey Him.” Her humble obedience has also rubbed off on the students she leads. These guys served tirelessly for 5 days roofing a house. 90% of them had never picked up a tool in their lives, but they were willing to learn and do what it took to begin the work on this home. Not only does Terah lead teams herself but she is also discipling and developing additional team leaders in her church. Last summer two of those leaders brought teams to Staten Island and New Orleans, both of which we had the privilege of working with. Encouraging students to serve and lead others to serve is a true passion of hers. And her students have brought it home to Maryland. 2 years ago they began a ministry in their youth group that serves monthly around the community.The focus on unmet needs and like to serve in unique ways. They help at a homeless shelter in Baltimore with made to order sandwiches, games, ice cream socials, birthday bingo and prayer walks. They work with a meal delivery service, do a free carwash and work with an inner city youth ministry. And they follow God’s teaching to take care of the elderly, sick and widowed. God’s glory shines brightly in Terah’s eyes and she contributes everything to Him. We are so grateful that she has obeyed His call…all 12 times! Blessings to you and a Happy New Year!